This intoxicating story of love, obsession and ambition, set in the decadent world of pre-World War One Paris where Lee Miller started her photography career under the tutelage of Man Ray, will have you gripped. 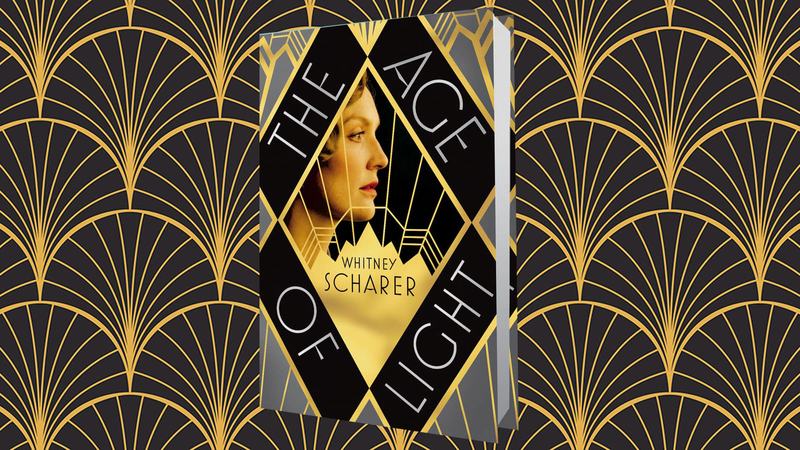 Here, Whitney Scharer introduces her book and shares an extract from The Age of Light. My brand new novel The Age of Light is out now and I’m feeling all the feelings: eager, excited, and nervous all at once. It’s incredible that the book is now out in the world being read by people like you! Earlier this month, I was extremely fortunate to travel to Barcelona to see Lee Miller and Surrealism in Britain, an exhibition on view at the Fundacio Joan Miro. For me, there’s nothing quite like the thrill of seeing Lee’s work in real life, and this exhibit gave me actual chills. It’s the first time I’ve seen any of Lee’s photos in person since completing my novel, and it resonated with me deeply now that I’ve been immersed in her life and history for so many years. I am extra grateful for the chance to reconnect with her work right before my novel goes out into the world. The exhibition explored the breadth of Lee’s Surrealist work, from the quirky fashion shoots she did for Vogue to a fantastic sculpture called The Kiss she made in collaboration with her soon-to-be husband Roland Penrose in 1937. The curators also highlighted some of her lesser-known works, including a wonderful portrait of Rene Magritte, where a coat and hat hung up on a coat rack behind him frame his figure perfectly, while also looming like a dark and almost ominous additional figure in the image. Seeing Lee’s work in the context of the wider Surrealist movement brought home for me again just how multi-talented and creative Lee was, and I can only hope I successfully captured her spirit, vision, and verve in my novel—and that the book may play a small role in making more people aware of her and her work. I’m now gearing up for my book tour in the UK and looking forward to meeting readers face-to-face. I’m excited to make stops at so many fantastic bookstores—from Waterstones Gower Street in London to Topping & Co in Ely, as well as many stops in between—and I do hope there’s one near you. Click here for a full and up-to-date list of where I’ll be reading. The night Lee meets Man Ray begins in a half-empty bistro a few blocks from Lee’s hotel, where she sits alone, eating steak and scalloped potatoes and drinking half pitchers of dusky red wine. She is twenty-two, and beautiful. The steak tastes even better than she thought it would, swimming in a rich brown roux that pools on the plate and seeps into the layers of sliced potatoes and thick melted slabs of Gruyère. Lee has passed the bistro many times since she arrived in Paris three months earlier, but— her finances being what they are— this is the first time she has ventured inside. Dining alone is nothing new: Lee has spent almost all her time alone since she got here, a hard adjustment after her busy life in New York City, where she modeled for Vogue and hit up the jazz clubs almost nightly, always with a different man on her arm. Back then, Lee took it for granted that everyone she met would be entranced by her: her father, Condé Nast, Edward Steichen, all the powerful men she had charmed over the years. Those men. She may have captivated them, but they took things from her— raked her over with their eyes, barked commands at her from under camera hoods, reduced her to pieces of a girl: a neck to hold pearls, a slim waist to show off a belt, a hand to bring to her lips and blow them kisses. Their gaze made her into someone she didn’t want to be. Lee might miss the parties, but she does not miss modeling, and in fact she would rather go hungry than go back to her former line of work. Here in Paris, where she has come to start over, to make art instead of being made into it, no one pays much attention to Lee’s beauty. When she walks through Montparnasse, her new neighborhood, no one catches her eye, no one turns around to watch her pass. Instead, Lee seems to be just another pretty detail in a city where almost everything is artfully arranged. A city built on the concept of form over function, where rows of jewel-toned petits fours gleam in a patisserie’s window, too flawless to eat. Where a milliner displays exquisitely elaborate hats, with no clear indication of how one would wear them. Even the Parisian women at the sidewalk cafés are like sculptures, eff t- lessly elegant, leaning back in their chairs as if their raison d’être is decoration. She tells herself she is glad not to be noticed, to blend in with her surroundings, but still, after three months in this city, Lee secretly thinks she has not seen anyone more beautiful than she is. When Lee has finished the steak and sopped up the last of the gravy with her bread, she stretches and sits back in her chair. It is early. The restaurant is quiet, the only other diners elderly Parisians, their voices too low for eavesdropping. Empty wine pitchers are lined up neatly next to Lee’s plate, and on the far end of the table is her camera, which she has taken to carrying everywhere despite its heaviness and bulk. Just before she boarded the steamer to Le Havre, her father pushed the camera into her hands, an old Graflex he no longer used, and even though Lee told him she didn’t want it, he insisted. She still barely knows how to operate it— her training is in figure drawing, and when she moved to Paris she planned to become a painter, envisioned herself dab- bing meditatively at a canvas en plein air, not mucking about with chemicals in a suffocating darkroom. Still, Lee has learned a bit about taking pictures from him and at Vogue, and there’s something comforting about the camera: both a connection to her past and something a real artist might carry around. The waiter stops by and takes her empty plate, then asks if she’d like another pitcher of wine. Lee hesitates, picturing the dwindling francs in her little handbag, then says yes. Even though her savings are getting low, she wants a reason to stay a little longer, to be surrounded by people even if she is not with them, to not go back to her hotel room, where the windows are painted shut and the trapped air always smells oppressively of pot roast. Lately she’s been spending more and more time there, drawing in her sketchbook, writing letters, or taking long afternoon naps that leave her unreplenished— anything to pass the time and make her forget how lonely she feels. Lee has never been very good at being by herself: left to her own devices, she can easily sink into sadness and inactivity. As the weeks have passed, her loneliness has gained heft and power: it has contours now, almost a physical shape, and she imagines it sitting in the corner of her room, waiting for her, a sucking, spongy thing. After he has picked up her plate, the waiter lingers. He is young, with a hint of mustache above his lip so faint it could have been penciled there, and Lee can tell he is intrigued by her. “Are you a photographer?” he finally asks, the word almost the same in French as in English, photographe, but he mumbles, and Lee’s grasp of the language is still so rusty it takes her a moment to parse his question. When she doesn’t respond, he tips his head at the camera. “Oh, no, not really,” Lee says. He looks disappointed, and she almost wishes she said yes. Since she’s been here, Lee has taken a few pictures, but they have been shots any tourist would attempt: baguettes in a bicycle basket, lovers pausing to kiss on the Pont des Arts. Her initial tries did not go well. The first time, when she got the prints back from the little camera shop around the corner, they were entirely black; Lee had somehow exposed the plates to light before they were developed. The second set— made with more care, the plates inserted into the camera gingerly, a light sweat dotting her upper lip— came back as murky gray masses, so blurry they could have been clouds or cobblestones, but certainly not close-ups of the sculptures in the park she had been shooting. Her third set of prints, though, was actually in focus, and looking at those small black-and-white images, conjured not only from her mind but from a unique combination of light and time, Lee filled with an excitement she never felt when painting. She had released the shutter, and where nothing had existed, suddenly there was art. In this episode of Book Break, Emma takes a closer look at the life of Lee Miller, and recommends some of her favourite novels inspired by artists. Whitney Scherer’s immersive debut novel takes the reader from bohemian Paris to the battlefields of WWII, in a dazzling story of love, art and obsession. The Age of Light celebrates a revolutionary artist long unfairly overshadowed by a man’s legacy.